Bandit - Shotgun. 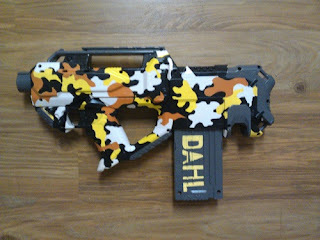 Made from a Retaliator with a custom pumping mechanism. 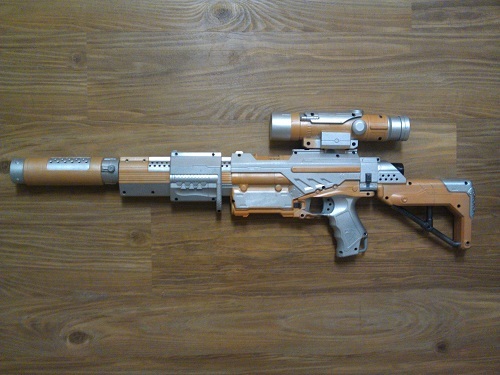 Jakobs - Sniper Rifle. 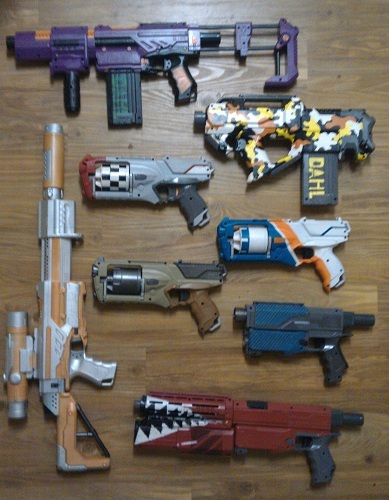 Started with an Alpha Trooper, with a Longshot scope, Retaliator stock, and Spectre silencer. Jakobs Revolver, from a Strongarm. 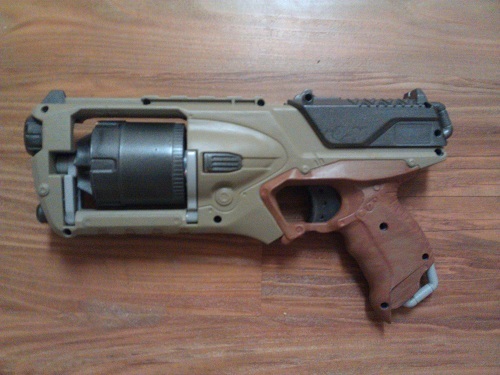 Tediore Pistol, made out of a Retaliator. 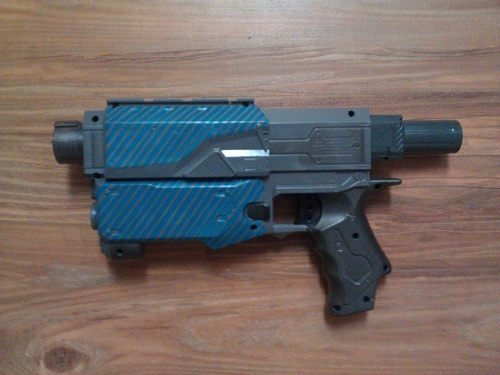 Veruc - Assault Rifle. (Dahl manufacturer). 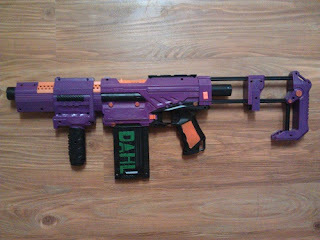 Alpha trooper body, Recon stock, Retaliator foregrip epoxied on. Dahl SMG. Made out of Rayven. Definitely the most time consuming to paint. I'm still updating the NERF painting tutorial as I learn more, expect progress pictures now that I've refined the process a bit. How did you paint the strong arm cylinders without the rotation being affected? 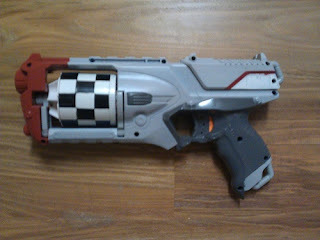 I painted mine but there was a ton of friction and the cylinder wouldn't rotate like normal. Vinyl dye was my neutral colored base coat. It doesn't have any build up and doesn't affect operation at all. Then I only used regular paints on the outermost parts, since they were so thick. 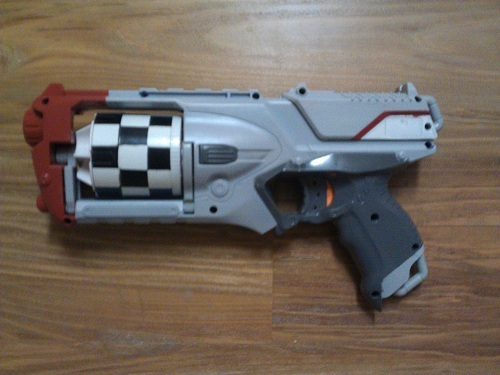 Vinyl dye is basically magic, you can use it on the entire blaster, inside and out, and every piece works like new. Awesome stuff man. Where do you buy vinyl dye from?I also hate how Krylon clearcoat leaves a lasting smell. Do you suggest anything better? Thanks again. 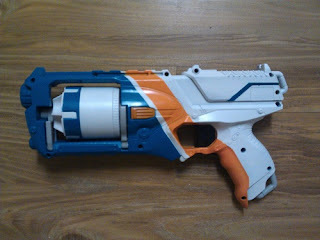 So the Oranges and blues and purples in the blasters shown was all Dupli-color or hand painted with acrylic? Duplicolors and Krylon rattle cans for all the other colors. I went all in with blue tape to get the designs, as I don't trust my hand painting skills.